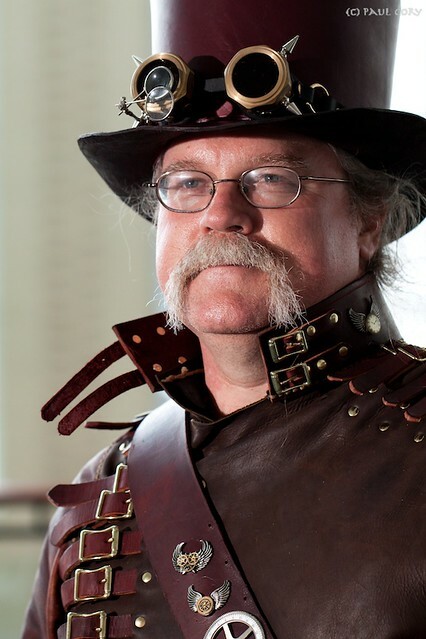 I'm wandering the halls of the North American Science Fiction Convention (NASFiC) in Raleigh, North Carolina, when I come across this fellow in a remarkable leather steampunk outfit. This part of NASFiC was happening in the Raleigh Convention Center, which meant huge windows letting in lots of light reflected from the sky. The good news was that I had a decent supply of soft light to work with: 160, f/2.8 or so @ ISO 400. That big hat, however, shadowed his face, which also dulled his eyes and the light was so soft it had very little shape. So, I added just a touch of flash to add shape to him, and some sparkle to his eyes. I had my flash on a small light stand, activated by a radio trigger, off to camera left, with a small (really small) Lumiquest softbox on it. I had the flash dialed way back, so that I was getting about 1 stop above ambient. I aimed the softbox in front of him, so he was lit more with the edge of the light coming out. While I like this, in retrospect I see a couple of things I could have done differently. First, I think a half stop, instead of a full stop, over ambient would have been sufficient. Second, a softer light source such as a bigger softbox, or an shoot-through umbrella, would still have given me shape, but with less harsh shadows. That little softbox was just too small and too far away to soften the shadows much. Another option would have been to use a ball head to allow me to flop the flash over into a vertical orientation, which would have allowed me to cover the subject with the flash physically a lot closer, which would have increased the softening effect of the little softbox.